Shripad SriVallabh told a Brahmin lady to devote her life to the worship of Lord Shiva. She did accordingly and, as a result of it, she was born in Karanja, a town near Akola (Central India) in a pious family and was named Amba. She grew and she was married to a pious man Madhava Sharma. She was devoted, heart and soul, to the service of of her husband. His noble company added to the holy tendencies she developed as a result of her spiritual discipline in her previous life. She now became an ardent devotee of Lord Shiva. In course of time, she gave birth to a son. The child did not cry, as usual, at birth. On the other hand, the only sound he uttered was ‘AUM‘ (the eternal sound – ‘AUM’ is the manifestation of the spirit) and everyone was amazed at it. Astrologers assured Madhava Sharma that their child was indeed an avatar of the Lord. They also prophesied that he would renounce all worldly ties and that he would uplift the fallen souls. The child was named Narahari. One day, the boy conveyed to them through gestures that he wished to be invested with the sacred thread. Young Narahari learned the ‘Gayatri Mantra‘, adopted the vows of a young celibate (Brahmacharya), accepted the first offering of food from his mother’s hands and at once recited the Vedas (external repositories of Spiritual Wisdom) . The parents were overjoyed but their joy did not last. According to tradition after the sacred thread ceremony, the initiate is a Sannyasi and has to beg alms from his mother and leave for pilgrimage. Thus, the mother asked him to beg alms and young Narahari, taking it as her adesha (command) sought permission to take sannyasa, renounce worldly life and leave for pilgrimage. The mother bewailed her plight and pleaded with him to give up such an idea. Narhari said “I do not want to enjoy the objects of the senses which can only lead to misery. So, I shall pass on from the state of celibacy directly to the life of a sannyasi. Wealth, family ties and responsibilities are as unreal as a dream. Youth is transient as a flower which soon withers. Thus life is very short when viewed in the light of the only purposed of it, i.e., Self-realization. To be emotionally attached to anything in this phenomenal world amounts to mere self-betrayal and is self-defeating too. This body, with the skin as its surface layer, flesh, bones and the blood within, is as frail a structure as a water bubble. Excessive fondness for one’s spouse and children is the root of all other evil tendencies. In itself, this body of ours is made of inanimate matter and is ever changing and perishable. Only the ‘Self’ within is eternal and is our only true being. Joys and sorrows of worldly life are merely relative, subjective and are therefore illusory experiences to the realised. Man can break the fetters of this illusion only through the grace of the Guru. Therefore, Oh mother, do not hinder me in my resolve. You shall be blessed with some more children. Go on meditating on me and thereby you shall cross the ocean of misery and ignorance too”. ‘Holy one, you are indeed Lord Sripaad, who, in my previous life, saved me from my unwise resolve to commit suicide. I bow before you. You are, indeed, the Unbounded one. All the universes have their being in your infinite expanse. To say that you are born to me as my son is but a fallacy; for you are eternal. Yours is the omnipotent will. I shall not hinder your resolve to renounce the world for the welfare of all sentient beings. You have assured me that I shall be blessed with a few more children. Pray, stay with us, at least till such time!’ Lord Narahari graciously acceded to her request and stayed away. The blessed couple used to worship the Lord every day with full awareness of his divinity. On his way to Badrinath, Narahari reached the Holy Varanasi (Kashi) in the guise of a seeker after liberation. 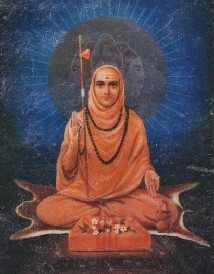 Lord Narahari, in accordance with Holy tradition, resorted to His Holiness Swami Krishna Saraswati as his Guru and from him took the vow of sanyas. Henceforth, He came to be known as Shri Narasimha Saraswati. He formally took the vow of lifelong celibacy. Thus he became a full-fledged sannyasi who has transcended the opposites of joy and sorrow and the limitations of a self-centered will. This World Teacher has laid down the tradition of sanyas for seekers after liberation. Shri Nrishimha Saraswati expounded the nature of sanyas to some and the meaning of the Vedas, which can secure the true objects of life (Purusharthas), to others. Then, he proceeded in his wanderings round the country in a clock-wise direction, along with his disciples. He had seven disciples and they were Baala, Krishna, Upendra, Janajyotim Sadaananda, Madhava and Siddha. All have the title ‘Saraswati’ suffixed to their names. Benares he went to Badrika Ashram with his disciples. Then moving from place to place for the welfare of common people, he arrived at Ganga sagar, near Calcutta. Some Twenty years passed this way. Shri Narasimha Saraswati reappeared at his home to the wonder and joy of his family and town people, He blessed them all. Shri Narasimha Saraswati then went to Trumbakeshwar, Parli and Parli vaijnath. At Parli Vaijnath he did penance for one year and remained in seclusion. Afterwards he went to Audumbar and Amarapur near the confluence of the rivers Krishna and the Panchaganga. At Amarapur he stayed 12 years. This place was called “Nrisimhawadi” and later “Narsobawadi” by his affectionate disciples and devotees. From Amarapur he went to Gangapur and remained there for 24 years. During his stay there many astonishing incidents and miracles took place. Shri Narasimha Saraswati was now considered as ‘Siddha Purusha’ (Perfect, almost Godlike being) with Divine powers of healing physical ailments and alleviating worries of his devotees. Hindus and Muslims used to come to him considering him their Sadguru. One day he bade good-bye to people of Gangapur and with his 7 select disciples went to the confluence of Bhima and Amraja rivers and stood for a while under the Aswatha tree. He stated “worship this tree and practice penance, your wish will be fulfilled and your life will be blessed”. He announced his departure from this world and his disciples were plunged in grief. A float was prepared on the banana leaves and was adorned with flowers. This float was placed in the river and Shri Nrisimha Saraswati sat on it. All the disciples offered worship although their hearts were weighed down by grief. Shri Nrisimha Saraswati cheered them up and told them he was going to Kadali-vana (grove of banana trees) near Srisailam (One of the 12 “Jyotir Linga” is located here) and upon reaching there, as a mark of his safe arrival, clusters of flowers would come back floating against current. Soon after, as per the Master’s promise, clusters of flowers came to them drifting on the river against the current! When the Master got ready for departure, the natives of the village rushed to him and begged him not to deprive them of His Divine presence, but to stay on. The Lord said, “Do not feel sad that way. How can I bear to be away from my devotees? I only seem to leave for Srisailam only to the grosser vision of the physical, but I will ever abide at Gangapur in my real state as the Spirit or the real Self. I will seek my noon alms in this village and accept your loving devotional services. My living presence will be experienced by anyone who bathes in the Sangam (confluence of holy rivers), worships the Holy peepal tree and takes darshan of my ‘Padukas‘ (sacred foot-wear) here. The atmosphere in all the three pilgrimage centers is sublime and devotees feel peaceful and spiritually uplifted. Miracles take place at Gangapur specially, even now. 1. In our short fleeting span of human life, we should attempt to realize God through devotion. 2. Use Buddhi (intellect) and Viveka (discrimination) to purify the minds. 3. Never think of hurting others in thought, word or deed. 4. Consider yourself blessed, if you secure the blessings of a Guru. 5. Strive to realize God who is inherent in your own heart.